I listen to about a dozen podcasts regularly and here are my top picks for news podcasts (in no particular order). 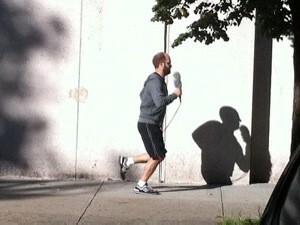 This list features funny, fascinating and innovative audio content commented by yours truly. Happy listening. Launched in January 2015 and hosted by This American Life and Radiolab alums, Invisibilia will appeal to fans of either show. It features real reporting on topics dealing with the invisible aspects of human existence: categories, expectations, fear, thoughts. I binge-listened to their first season which was only six full episodes. According to a review in The New Yorker, the show ‘combines sophisticated storytelling with cultural and scientific reporting, yielding astonishing stories that can feel almost too good to be true’. Hear, hear! This show was my gateway drug to the wonderful world of audio storytelling. TAL as a radio show has been around since 1995 with host Ira Glass. He presents multiple stories per week around a given theme. Stories range from funny to serious to thought-provoking and often the styles vary across an hour-long episode. The show is consistently engaging and timeless: you could spend a lot of time in their archives. In fact, they recently launched a 24-hour digital streaming channel that broadcasts all episodes from the TAL archive randomly ‘until the end of time (or more likely, when our server crashes)’. Go listen, you won’t be disappointed. 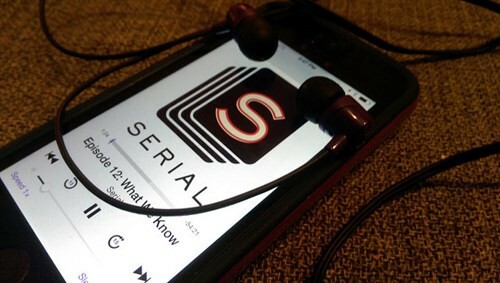 You’ve probably heard of Serial at this point, it’s the podcast that has been hailed as the harbinger of the audio revival with over 75 million downloads according to The Guardian. For those still unfamiliar, the podcast (a This American Life spin-off) follows a true crime story of a 1999 murder case in Baltimore, Maryland. Then highschooler (and now household name) Adnan Syad was found guilty of killing his ex-girlfriend Hae Min Lee and sentenced to life in prison. Producer Sarah Koenig began to look into the case’s loose ends on the request of Syad’s friend. And loose ends she found: a disbarred defense attorney, an unquestioned alibi witness, contradictory police interviews. Koenig and her team report on their investigation as it takes place, presenting a new chapter each week. Serial achieved what TV shows have been trying to chase since the rise of delinearised content: event entertainment. For the 12-week run of season one (October to December 2014), millions gathered around their devices every Thursday for the latest installment. Its popularity sparked much discussion about audio formats, objectivity, true crime and audience trends. I enjoyed PBS Idea Channel’s response to the phenomenon. The podcast’s popularity notably reached beyond U.S. borders making top ten lists in Germany, Australia, the U.K. and South Africa, according to The Wall Street Journal. This podcast is perfect for news media and journalism nuts. The hour-long weekly episodes delve into recent news stories as well as reporting trends with enough variety to keep you interested throughout. As a bonus, they also just started producing ‘House of Cards’ recap episodes with great interviews for fans of the series. This weekly news quiz is my Sunday morning ritual. It’s a recording of their live show performed for an audience, nothing revolutionary in terms of audio production but it’s charming in its simplicity. A panel of comedians joke about politicians, celebrities and bizarre news stories from the week. An amusing way to catch up on the news if ever you’re feeling a bit disconnected. Limericks included. This may be a ‘a show about the Internet’ but don’t be intimidated if you’re not a super tech geek. This second show from podcasting newcomer Gimlet explores the interwebs through a human lens. Some topics include the French Minitel, dating site scammers and how to host a site that even Kim Kardashian won’t be able to break. 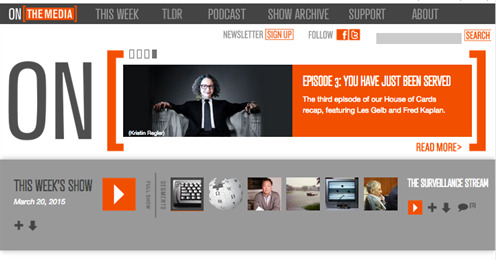 Reply All is interesting, accessible and easy to digest: episodes are usually 15–25 minutes each. Okay, so this one isn’t exactly a news podcast, but it makes my list because The Truth does truly amazing things with audio production. I’d describe their original stories as a modern-day version of ‘The Twilight Zone’, always an unexpected twist at the end. Their tagline, ‘Movies for Your Ears’, very justly describes their listening experience. In fact, I only listen to The Truth at home because their sound design is so realistic that it’s actually disorienting to listen to in public. The Truth is a founding member of Radiotopia from Public Radio Exchange (PRX).